New lanthanide complexes with 4-(2,1,3-benzothiadiazol-4-ylamino)pent-3-en-2-onate (L–) [Ln(L)3] are synthesized using two methods: by the reaction of Ln(N(SiMe3)2)3 with the protonated form of the ligand LH (Ln = Sm, Gd) and by the reaction of LnCl3 (Ln = Eu) with LH in the presence of KN(SiMe3)2 as a base. According to the X-ray diffraction data, the synthesized complexes [Ln(L)3] · 0.5Solv (Solv = THF, C7H8) are isotypical (CIF files CCDC nos. 1826520, 1826521, and 1826522 for Sm, Eu, and Gd, respectively). A specific feature of the structures is the disordering of the metal atom and one of the ligands over two positions when the fragments of the ligands are arranged via the head-to-tail type occupying the same volume of the space. This probably leads to failure in the crystal lattice. The photoluminescence spectra of [Sm(L)3] · 0.5THF are recorded. 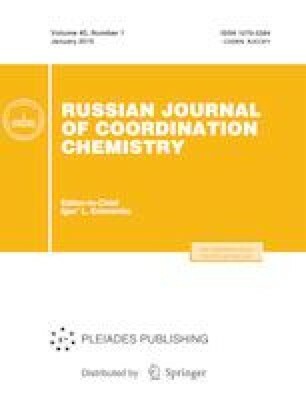 A relationship between the coordination mode of the ligand and the position of the long-wavelength band of the electron transitions in the complexes with the L– ligand is revealed. The authors are grateful to A.P. Zubareva and O.S. Koshcheeva for performing elemental analysis and to A.A. Ryadun for recording luminescence spectra. This work was carried out in terms of the state task and was supported by the Russian Foundation for Basic Research, project no. 16-03-00637.